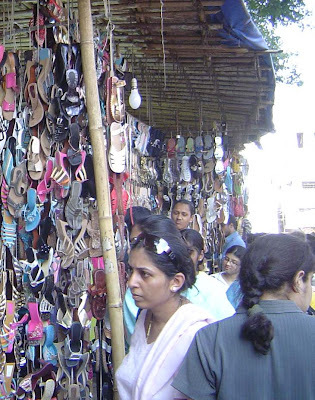 If you're on a budget and still want to shop, head for the street stalls on Linking Road. Nothing fancy about them, but they sell everything you can think of: bags, shoes, skirts, hairclips, belts, sun glasses, bras, undies...and all of it for prices that are amazingly low. Last week I went to Linking Road looking for a challa - an ornament for the waist (don't ask me why I wanted it!). I had to hunt long and hard to find it - apparently challas don't have any takers on Linking Road these days - so I ended up clicking a lot of photos of other shops instead. Skirts with fancy beadwork at the waist. The gypsy look is obviously in. Salwar kameezes and ghagra-cholis in several colours. The kameezes are elegant when sleeveless, but for more modest women, there are matching little sleeves that can be attached by a tailor. Indian women traditionally prefer cuts that are loose and straight, that don't hug the body and outline every curve. But the shopkeeper wants to make the mannequin look sexier, so he bunches up the fabric and clips it at the back, like in the pink kameez in the photo above. Bags to go with whatever clothes you buy. Some bags can pass off for expensive stuff, but you need a fine eye to figure out which ones. The guys who own bag shops are armed with two things - one is a long stick with a sort of nail at the end - that's for picking bags off the "shelves" and putting them back. The other is a duster. This is the roadside, remember? Dust settles constantly on the bags. If you ask the shopkeeper to show you a bag, he uses the long stick to bring the bag down, gives it a few whacks with the cloth duster, and only then hands it to you. Bags are all very well, but everyone knows shoes are serious business. Even if they're dead cheap. There are lots and lots of shoe shops here. The shoes are perfect for college kids - colourful, funky, affordable. You can also buy party shoes here, but don't expect them to hold out long if you're planning to dance the night away. Hair-clips and bands for little kids. The price ranges from 5 rupees to 50. In the UK, I've seen similar things sell for at least twice or thrice the price. I really must find out where these underthings are made. I used to think they came to Bombay from somewhere Far East (because the bras are all padded, you know?). But now I'm not so sure. Maybe we're making them here to *send* to the Far East, and these are factory rejects. Anyway, it was surprisingly difficult, clicking photos on Linking Road. No matter how patient or clever I was, someone or the other would walk into the frame and ruin the whole thing. After about 30 minutes of clicking away, I found one shop that sold what I wanted - oranmental challas. An air-conditioned shop, that too. I looked at several designs that the counter salesman showed me (I tell you Bombay shopkeepers are a really patient lot) - and finally walked home triumphant with something in gold and maroon. Total damages for the day: Rupees 700. Not bad, not bad at all. Reminds me of shopping trips as a kid to Colaba Causeway and the street vendors along DN Road. I wonder if they're still there? you have seen lingerie for 2-3 times the price in UK. You got to be kiddin me! your article would have been more appealing to people who want to invest in Indian commodities, if you had mentioned it is 20 times more expensive! The reality is in US and UK, clothes are by far over priced and if you are talking about lingerie, it doesn't fall under the supply-demand theory. They are ridiculously overpriced. but do u think we can get trendy clothes at linking road...i find it difficult to shop n get clothes lyk my college gurl frnds get..still nt able to get how to get sum really nyc wardrobe?